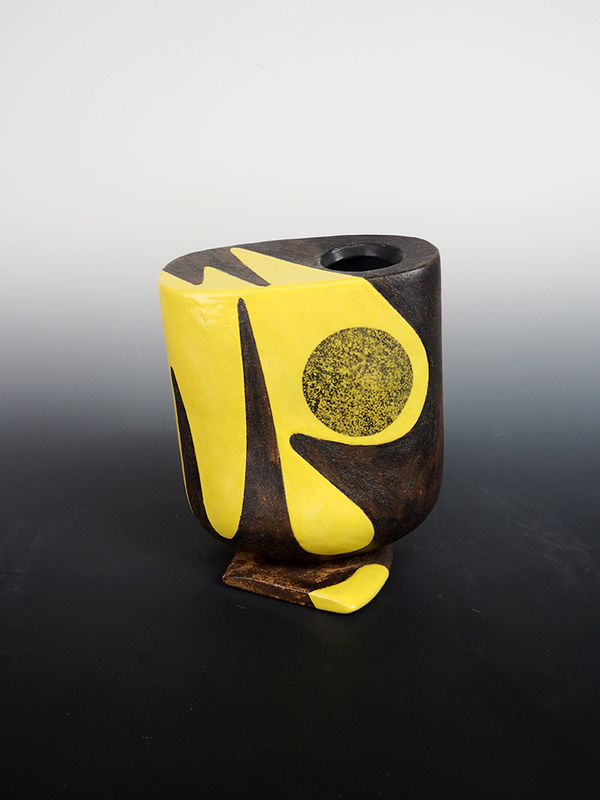 SOLD | YANAGIHARA Mutsuo | Yellow Oribe with Silver Overglazed Flower Vase — Dai Ichi Arts, Ltd.
Yanagihara Mutsuo's Where the Soul Resides comes out of an ancient Japanese folk belief that the spirit resides inside of an object, such as an egg, cocoon, or shell. Instead of the found objects of tradition, Yanagihara has created a beautiful vessel befitting such precious contents. Furthermore, a small rattle can be heard from inside the piece when it is lifted and moved, representing the artist's own spirit caught up in his creation. Yanagihara, who was born in 1934 in Yamaguchi, taught art in the United States in the late 1960s and early 1970s. His time in the West instilled in him a great interest in and respect for American and European abstraction, one that would manifest in his later work. The bulbous lip and mysterious quality of Where the Soul Resides bears a resemblance to the surrealist works of Miro, Arp, and Picasso. Like these artists, Yanagihara's work holds a latent eroticism that is accentuated by the extravagantly organic line. But, being part of the Japanese tradition, Yanagihara has translated this aesthetic into three dimensions. Even so, the piece seems to struggle between two- and three-dimensionality: the lip juts out from a very flat, almost two dimensional surface. Yanagihara's work is well respected among experts, and is included in the collections of the Japanese Ministry of Foreign Affairs; The National Museum of Art, Tokyo; the National Museum of Art, Kyoto; and the Victoria and Albert Museum. YANAGIHARA Mutsuo | Vessel "where the soul resides"